1. A nod to the past. Lady Proxima’s scrumrats don’t have many possessions, but Rebolt has incredibly valuable ones with his four Corellian hounds. How he acquired the hounds is a mystery, but he uses them and their intimidating regenerating teeth to threaten other scrumrats and to leverage his position in the White Worms with the gang’s matriarch. He spoils the hounds (not dogs, as he constantly points out) with biscuits that taste as good or better than the food served to the scrumrats. 4. It’s all about the look. The Corellian hounds, like all creatures, began with sketches. The concept design team started with the idea of a real dog with a Star Wars alien vibe. 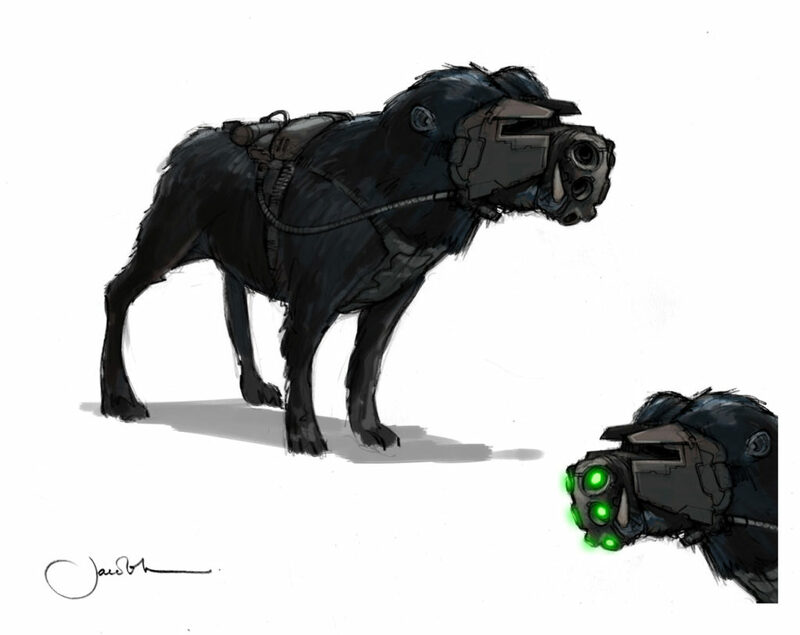 In one look by Jake Lunt Davies, the hounds wore muzzles with eerie green lights; his idea “was to give it a touch of gorilla mixed with some hard tech around the nose but basically keep a lot of real dog fur.” The concept team tried a variety of possibilities, some incorporating armor or warthog-like fur, but ultimately, Martin Rezard came up with the final creature design and sculpt; Sherri Hazzard and Laura Sindall worked on fabricating the suits for the performers. 5. Dogs got into character. 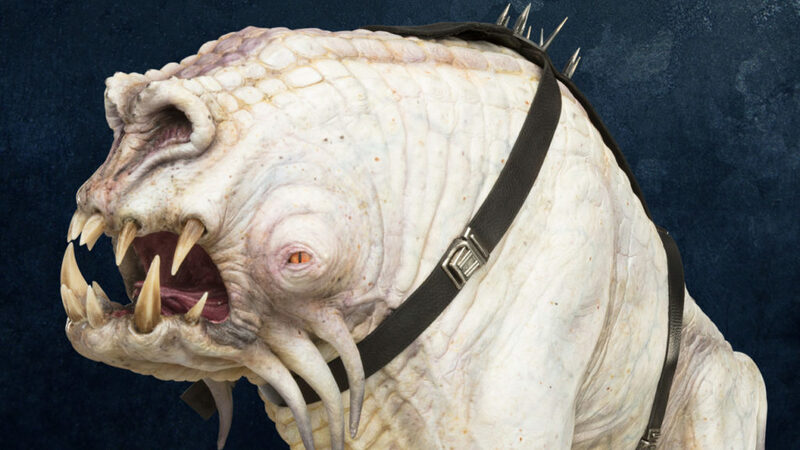 The Corellian hounds are terrifying…unless you see what’s inside them. 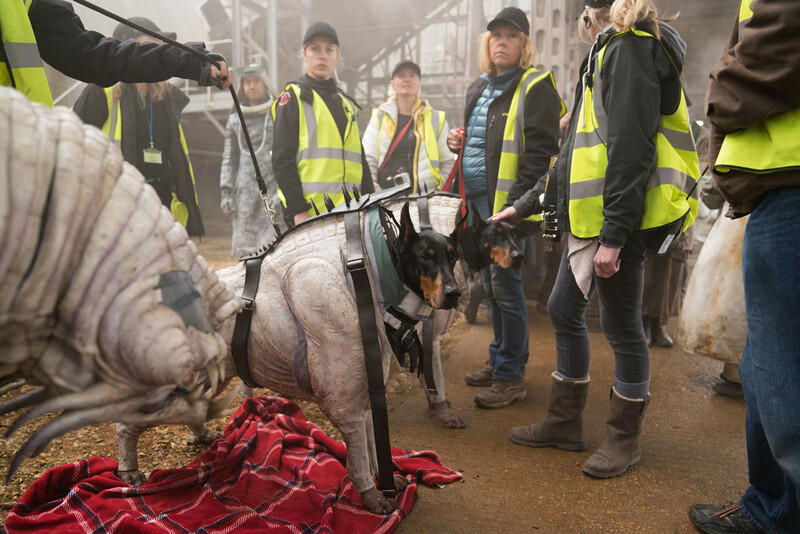 Actual dogs played the beasts for certain sequences in the film, including dashing after Han and Qi’ra. The dogs were trained for months so they’d be comfortable in the suits, which were designed to keep the animals as comfortable as possible. They’re wearing stretchy suits covered in foam muscle Corellian hound suits. Solo creature and droid effects creature supervisor Neal Scanlan had the idea to use real animals, and it goes back to a method used in Star Wars: A New Hope when an elephant performed as a bantha. Scanlan said, “They [the dogs] loved it so much they actually put their own prosthetic heads on. All you had to do was hold the creature head, and they walked up and put their heads in it.” The dog stars are two Dobermans named Blackie and Boyce and two Northern Inuits called Saxon and Elsa. The dog squad wasn’t used for every shot in Solo. To get everything they needed, the creature team turned to puppetry. They fabricated and used automated puppets and rod puppet versions of the hounds. In some scenes with Moloch’s speeder chasing after Han and Qi’ra, puppeteers Brian Herring and Colin Purves operated the rod-puppet hounds from the cargo hold of the vehicle. Sources: Jon Kasdan, Most Wanted, Solo: A Star Wars Story The Official Guide, Jake Lunt Davies, The Art of Solo: A Star Wars Story, StarWars.com.